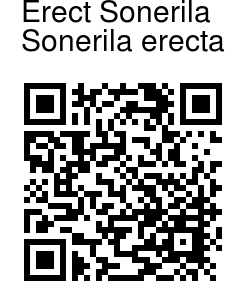 Erect Sonerila is a herbs 5-18 cm tall. Stems are slender, almost 4-sided, with sparse spreading glandular trichomes. Leaf-stalsk are 0.4-1.5 cm, glandular hairy. Leaves are narrowly elliptic to ovate, 1-2.5 × 0.4-1.6 cm, membranous, secondary veins 2-3 on each side of midvein, base wedge- shaped, margin toothed, tip shortly long-pointed. Inflorescences occur at the end of branches, in 1-5(up to 11)-flowered cymes, 1-4.5 cm. Flower- stalks are 2-7 mm, somewhat 3-sided, with scattered glandular trichomes. Sepal cup is tubular, 4-5 mm, up to 1.7 mm in diameter, almost 3-sided, 6-ribbed, usually with sparse glandular trichomes on ribs. Sepals are broadly ovate-triangular, 0.5 mm. 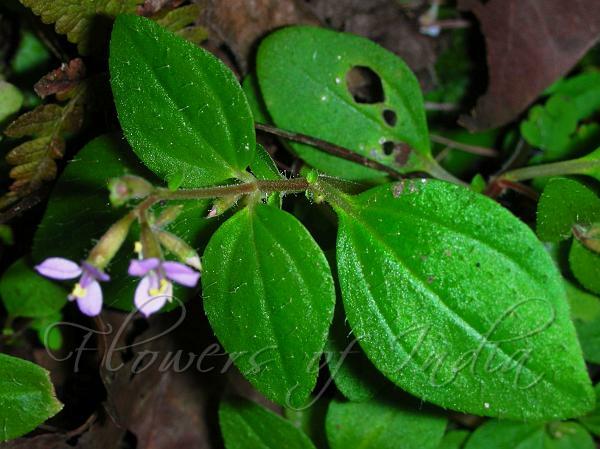 Petals are pink to purple, oblong- elliptic, 3-3.5 mm, oblique, with sparse glandular trichomes on ridge, tip pointed. Stamens are 3, nearly equal; filaments as long as anthers; anthers broadly ovate, 1.8-2 mm, base forked. Ovary is flask-shaped, membranous crown 3-lobed. Capsule is tubular, 4-7 × 2 mm, 3-sided. Erect Sonerila is found in the Himalayas, from Garhwal to Sikkim, N. India, Indo-China, S. China, Philippines, at altitudes of 600-1500 m. Flowering: July-October.